People have been making music as long as there's been people. The earliest musical instruments we have appear to be bone flutes, around 40,000 years old, found in Germany and Slovenia. The earliest composer whose name we know was from Ur, in what's now southern Iraq; she was an Akkadian high priestess, her name was Enheduanna, she lived around 2300 BC and she wrote hymns. Her music hasn't survived, but her words have, making her not only the earliest composer we know about but also the earliest author. The Book of Psalms (c. 600 BC) is full of references to music-making, but no music from that period has survived. Greek tragedy (the 400s BC) was at least partly sung, but we're not sure what the tunes were and only fragmentary bits of ancient Greek musical notation have survived. The first music in the West to be written down in a notation similar to the one we use now was Gregorian chant. Gregorian chant doesn't get written down until around AD 900. So that's where the story starts. The first thing you might notice is that every voice is singing exactly the same melody at the same time. That's one of the defining things about Gregorian chant that makes it unlike almost all subsequent music. The technical term for it is monophony. Now listen to Dies irae (Track 2). It's also monophonic. It's a bit lower down the register, and the tune is less decorated and more repetitive, but in other respects it's not all that different from Viderunt omnes: neither of them get dramatically louder or quieter and they keep a fairly steady flow throughout, with everyone singing the same thing at the same time. The great thing about Gregorian chant is that it's all like that: solemn, meditative, undramatic and fairly simple. It was written with one purpose: to the focus the listener's mind on the contemplation of God. It's pretty good at that, which is one reason it's so popular as chill-out music. Another is its glamorous patina of age. Gregorian chant, we are told, dates back to the 9th century. Feel the old! Taste the tradition! Gregorian chant developed out of older kinds of Christian chant in the first centuries AD. The church literally wanted everyone to be singing from the same hymn sheet, which is why Gregorian chant happened to be the oldest Western music to be written down. To begin with, this was done by making marks above the text, in order to remind the singer more or less when to go up and when to go down, but it only worked if you already knew how the tune was meant to be sung. Then, in the 11th century, a monk called Guido of Arezzo devised a system of lines and symbols which showed, fairly clearly, exactly what notes to hit, how to hit them and what to do with them once you'd hit them. 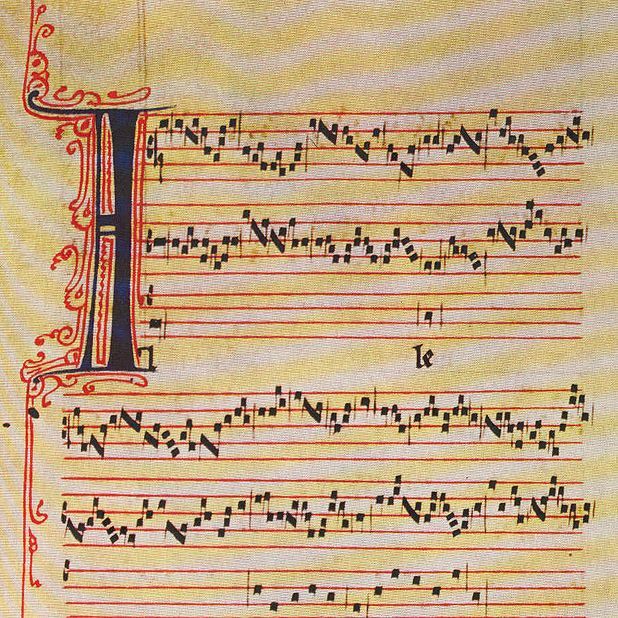 Guido's notation is the ancestor of modern music notation, and it's still in use today, but only for Gregorian chant. There are other kinds of chant still being sung, such as Ambrosian chant and Old Roman chant, and the Orthodox churches use their own Byzantine chant. Why is Gregorian chant so much more famous than the others? The answer is a little unsettling, at least for people who like chant because of its ancient-ness. 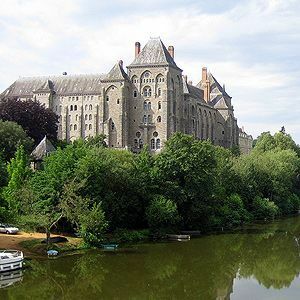 In 1903, Pope Pius X decreed that since Gregorian chant was by far the most commonly used music in the Roman Catholic church, and since the monks of the Abbey of Solesmes (pictured) were such dedicated scholars of it, that the Abbey of Solesmes should produce an official edition of all the chants in use in the church and when they were to be used. Sadly, it wasn't called Pius Ten's Bumper Book of Chant but the more pedestrian Liber Usualis, and it still has pride of place in the Catholic liturgy as the official, Vatican-approved anthology of Gregorian chant. It's a thick black book of over 2000 pages and a treasure-house of Catholic music. However, in the preface, the editors admit that they haven't actually used the oldest chants they could find, but have based their selection of chants on account of "their religious and artistic flavour, and their power of giving suitable expression to liturgical prayer." In other words, the standard edition of Gregorian chant is a 20th century edition made according to 20th century standards of taste. Since almost all recordings of Gregorian chant use the Liber Usualis as the basic text, that does make Gregorian chant seem a bit less ancient than it's cracked up to be. But that needn't stop us from enjoying it, even if we bear in mind that something as lulling as Dies Irae is actually about how God's wrath will send all sinners to hell. That's the problem with Gregorian chant; soothing as it sounds, if you happen to know what they're singing, it quickly becomes intimidating. Most chants are anonymous, or at least only scholars know who wrote them. Only one composer of chant has achieved fame in our time: Hildegard of Bingen. 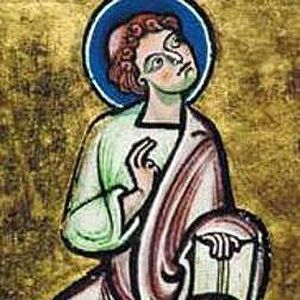 Hildegard (1098-1179) deserves a mention anyway because she's not only the first woman composer whose music has survived, she's also one of the earliest composers whose name we know. She was an abbess from Germany whose music has become very popular in the last decade or so. She had ecstatic visions. (The psychologist Oliver Sacks makes a good case that Hildegard actually suffered from chronic migraines, but not knowing of the existence of migraines and being very religious, she interpreted them as visions.) She was highly creative and left behind some fascinating writing with striking illustrations that she supervised herself, and she also wrote mesmerising music. Columba Aspexit (Track 3) is a good example. If you compare it to something like the standard chant of Requiem Eternam (Track 4), it's more complex and ambitious, with a winding, unpredictable melody that goes way higher and lower than the chant does. It's not easy to see how Hildegard constructed her music but her melodies often tend to start from the same basic phrase, and then go off on ever more complex and wide-ranging journeys, before returning to the same note from which they began. Hildegard's holistic vision makes her an early example of a notable kind of composer in that her art spread across music, writing and the visual arts. The most famous later composer who'd do this is Richard Wagner, in the late 19th century. Music didn't just come from religious sources. The other seeds were secular. Time to throw down with the troubadours! Troubadours? Really? People with lutes wandering all over Europe, singing songs about their lady-loves? No, sorry. You're thinking of jongleurs, who were poor itinerant musicians whose music didn't get written down but, if it got passed on at all, got passed on as the rich traditions of folk music enjoyed in every European country with the possible exception of England. Troubadours were usually upper-class and were attached to courts, where they composed songs and dances for the amusement of other upper-class folk. The surprising thing is that troubadour music, when it's performed with what Frank Zappa called 'eyebrows', can sound awesome. Like Gregorian chant, troubadour music was written down without any indication of rhythm and therefore needs a good deal of interpretation to play it at all. A group such as Ensemble Unicorn (Track 5)plays it as though it were contemporary folk-rock, and it works. The singer on their recordings is the late great Catalan singer Maria D Laffitte, and her twangy, Piaf-like warble seems to me to bring ample eyebrows to the music of people like Berenguier de Palou and Bernart de Ventadorn. 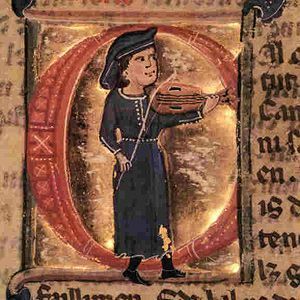 To get an idea of how different approaches can put a different spin on a song, let's listen to two different versions of the song Ce fut en Mai, a traditional melody with words by Moniot d'Arras, who lived around about 1225. Ce fut en Mai has been much admired over the centuries for its lilting melody, although the words tell a strikingly bizarre story. First, have a listen to the version by Freiburg Spielleyt, a German early music group with a very fine classically-trained singer, Regina Kabis (Track 6). Kabis speeds up and slows down for emphasis; she gets louder and softer as the text demands it; she's got serious vibrato going on, and her voice has that clear tone of the classical singer. Now, listen to the English singer June Tabor doing the same song (Track 7). Tabor pitches the song lower to suit her deeper and darker voice, but she also sings it with less drama, and the arrangement has a dispassionate, sea-shantyish lilt. Freiburg Spielleyt, skilled as they are, sound like they're playing in a 19th century drawing room. I know which one I prefer. In mid--12th century Paris, Bishop Maurice de Sully ordered the construction of a new cathedral. It was called Notre Dame de Paris, and at the time it was one of the most avant-garde buildings in Europe. It took a century and a half to build, so no surprise that it was being used as a church long before construction finally halted in the mid--14th century. During that period, something radical happened in the way the cathedral choir sang. We don't know how exactly it happened. The evidence we have consists of Notre Dame's own collection of anonymous choral music, and a testimony from an anonymous source known to music historians as Anonymous IV because...well, never mind why. Anonymous IV identifies one piece in Notre Dame's collection as being by a guy called Léonin (pictured), and he points out that what Léonin did was take our old friend the Gregorian chant Viderunt Omnes, drastically slow down the opening few syllables, give them to most of the choir to sing, and then have a soloist sing a heavily decorated melody over the top. The result is the first written example of medieval polyphony, meaning that there are two separate melodies happening at the same time (Tracks 9-10). But it gets better. Anonymous IV goes on to say that Leonin had a student called Pérotin, and Pérotin took his teacher's ideas and turned them up to eleven by taking the two-part Viderunt Omnes and adding two more voices to it. The result was the piece now known as Viderunt Omnes: Organum Quadruplum (Tracks 11-15). It was probably first performed in then-unfinished Notre Dame Cathedral on January 1st 1199. It subsequently got distributed across most of continental Europe. Western music was never the same again. When we listen now to Pérotin's Viderunt Omnes, the moment when the huge opening unison note breaks up into individual voices is like looking at a crowded medieval painting which abruptly comes to life. The first section consists solely of the choir singing the phrase 'Viderunt Omnes' and yet it takes them five minutes to get through all five syllables because, after the austerity of Gregorian chant, this music glitters with internal drama and tension and resolution. Chant shuts out the bustle of the world and focuses your mind on God, but this is music that tries to picture how life is actually lived. Listen to the way that the whole sound of the music changes as the singers shift from one syllable to another. You can tune out Gregorian chant. You can't tune out Pérotin's Viderunt Omnes. It grabs your attention. And from here on in, the story of music will be, in part, a story of how composers sought newer and fresher ways of grabbing your attention. In our next instalment, get ready for things to become much more complex, because it's time for … the Renaissance!